As the largest open-air market found in the Southern Hemisphere, the Queen Victoria Market is the heart of Melbourne and is the one-stop destination for food, shops, culture, and heritage. 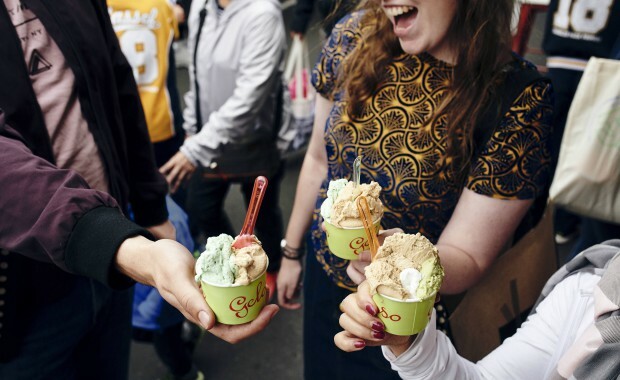 Whether you’re visiting Melbourne or native to the city, the Queen Victoria Market Ultimate Foodie Tour is an amazing way to dive into the many tastes, flavours, and vendors of the esteemed market place. We chat to the tours program co-ordinator Bettina de Chateaubourg to get the full scoop. First up can you tell us a bit about the Queen Victoria Ultimate Foodie Tour. What exactly is it and how does it all work? In short, the Ultimate Tour is a two-hour walking tour through the food precincts of the Market. Along the way, the tour guide shares stories about the Market and our traders offer guests tastings such as grilled kangaroo fillet, local cheese, oysters, fine chocolate and, of course, doughnuts from the famous American Doughnuts Kitchen. It’s a movable feast! Have these tours been running for quite some time now, or is this a new experience? The tours began over 20 years ago as a temporary offer for the Melbourne Wine & Food Festival. It was so popular that the Market decided to make it a permanent fixture. Since then, many food-focused walking tours have been established but I like to think that none of them can match the Queen Vic tour for personality and authenticity! Does the tour change seasonally? How do you go about selecting traders that provide the tastings for the groups? The food does change seasonally, but only in terms of provenance and seasonality. For example, we might offer a cheese that a local cheesemaker has just started producing or is only available at that time of year. Likewise, we might offer South Australian oysters over Sydney Rock oysters as they’re better at that particular time. Weather also plays a part. In warmer weather, we offer gelati (made here at the Market with seasonal fruit), whereas in cold weather, we might offer mulled wine. Our traders generally approach us when they wish to participate in the tour. We then work with them to create something that we think will both highlight the trader and fit with the menu. What type of people are guiding the tours? Are these knowledgeable foodies, chef, etc. Second to our traders, our tour guides are our greatest asset. They are all knowledgeable foodies with a keen interest in the food culture of Melbourne. On top of that, they also have varied other skills including theatre, teaching and history. For instance, one of our tour guides is an ex-ballet dancer and another is a barber! All of them have terrific personalities and I feel fortunate to be able to work with them. Who are the tours best suited to (tourists, families, couples, friends)? Is it child-friendly? I think the tours are suited to everyone. We have many international visitors on our tours but we also have lots of locals – people who haven’t been to the Market for years and are interested in re-discovering it. The tour is definitely child-friendly. Attracting young people to the Market is something I’m very passionate about so, if I know there are children on the tour, I let the tour guide know and we tweak the content and the menu a little so they don’t feel left out. Does it cater to allergies and intolerances? If someone mentions that they are unable to eat a particular product, we try and provide an alternative. That said, we don’t change the menu to cater for one person on the tour. There are plenty of tastings so, if someone can’t eat one thing, they definitely won’t go hungry. What are the benefits of someone doing this tour, as opposed to exploring the Queen Vic Market unguided? Whilst it’s fun to explore the Market on your own, it can be a daunting experience. After all, it does sit on six hectares and have over 650 stalls! On a tour, you’re able to relax and enjoy the adventure. The traders will often come out and have a chat when they offer tastings and I think that makes it more of a personal experience. Plus, you get to eat a lot of delicious food!! For someone that’s never attended Queen Vic Market before, what can they expect from it, and these tours? Guests can expect to discover the history of the Market and the food culture of Melbourne in a fun and entertaining way. They will meet the traders and hear their stories and will be offered a taste of their best produce. Best of all, though, they will experience the unique community feel of the Market. It’s a joyful, energetic place where people from all different backgrounds congregate and I think that’s what makes it so special. Visit qvm.com.au/tours/ for all the deets!